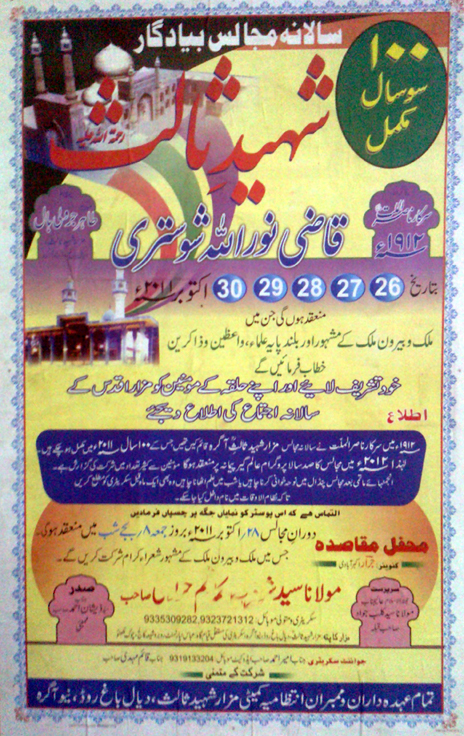 There is Majalis at the shrine of Shaheed-i-Thalis, Qazi Nurullah Shushtari (r.a.) from 26th to 30th October 2011. Wherein national and international scholars, elites and poets will grace their presence. Mazaar Shaheed-i-Thalis, Dayal Baagh Road, New Agra (UP). Qazi Nurullah Shushtari entitled Zia-ud-Din known as Amir Sayyid and Shaheed-i-Thalis was born in 956 A.H./1549 A.D. at Shushtar one of the cities of the present Khuzistan province in South of Iran. He was sayyid by lineage and belonged to the Mar'ashi family that claimed to be the direct descendant of lmam Ali bin Husain (A.S ). His father Sayyid Sharif-ud-din and grandfather Sayyid Zia- ud- Din Nurullah got his early education at home from his father and the other teachers at town.After completion of it in the year 979 A.H. , he went to Mashhad, the holy city in the Khurasan province. The land that had been plundered by Uzbeks before his arrival and also afterwards. They had turned the region almost in such a battlefield which passed through many events of onslaught , massacre , plunder , looting and destruction. Qazi Nurullah lived in the city for fifteen years and completed his education there under the guidancc of the profoumd masters of their subjects like Abdul Waheed Shushtari and many others . 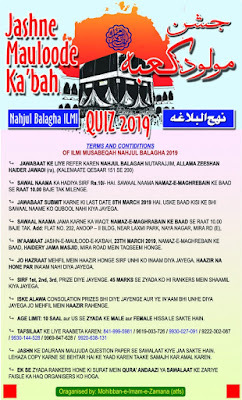 In the field of knowlesge as he has pinted out had his lineage of teachers connected with Jalal-ud-Din Dawwani , the most renowed philosopher and great scholar of ninth century of Hijra era/16 th century of Christian era. Qazi Nurullah came to India in the year 992 A.H./1584 A.D. and was introduced to Mughal emperor Jala-ud Din Akbar in the year 963 A. H./ 1556 A.D . by Hakim Abul Fath Gilani(d.997 A.H./1589 A.D.) and became one of the close associates of the emperor , who appointed him grand vizier and the chief justice of the empire . In judiciary department , he performed his duties so unbiasedly that even his sectarian opponents admitted of his equity , justice , fairness , honesty , nobility , modesty , piety , tolerance , wisdom , wittiness and his proficiency over various school of jurisprudence.He was also quite prudent to fight against the corrupt people at the court of the king . Ahqaq-ul-Haq (Justification of the Truth ) : In this work he has defended the beliefs of Shi'ite faith . Majalis-ul-Mo'mineen ( The Assembly of the faithfuls ) : Gives the description of the religious scholars and the other learned men . Risala-i-Jalaliyyah: A treatise dedicated to Jalal - ud- Din Akbar , the Mughal emperor of Hindustan . It consists of knowledge . Marginal notes on several books like Shamsiya written about logic . Sharh-i-Tajrij is regarding scholastic theology . Khulasa-tul Aqwal : Deals with the biographies . Sharh-i-Chaghmini: is on astronmy . Tahrir-i-Uqlidas : is on geometry . Sharh-ul-Hidaya : is on philosophy. Sharh-i-Waqaya and Hidaya : both these works are on Hanafi school of jurisprudence . Sharh-i-Aqa' id-i-Nasafi : is on the theology of the Sunnite Muslims . Sharh-i-Mukhtasar-i-A'zdi : id on the principles of the jurisprudece dealing with Sunnite Muslims .